When it comes to fruit, I’m a bit picky. Cherries are one of my least favourite. It makes things difficult at times. I’m no good with Black Forest cake or with traditional Christmas goodies like Christmas pudding or rumballs. I guess that’s a good thing, one less thing to be tempted by. Some fruit can be picked a little unripe, because it will still ripen after it’s picked. Cherries are a bit more delicate. Apparently when it comes to picking cherries, the key is to pick only the ripest fruit and leave the rest on the tree. In science, “cherry picking” is a colloquial expression for the practice of selectively picking or presenting only the information that agrees with your personal theory, ignoring the rest. Richard Somerville put it well: “Choosing to make selective choices among competing evidence, so as to emphasize those results that support a given position, while ignoring or dismissing any findings that do not support it, is a practice known as ‘cherry picking’ and is a hallmark of poor science or pseudo-science.” (Testimony before the US House of Representatives Committee on Energy and Commerce Subcommittee on Energy and Power, March 8, 2011). You can see cherry picking everywhere if you know what to look for. It’s usually done by advertising and PR firms to make a product sound all sciencey or mediciney, something like, “Research shows that …”. Then deep in the fine print is a reference to a single scientific paper. When you actually look at the article in question, the “research” is weak or horribly biased. Cherry picking is also common amongst organisations with a barrow to push, or websites like Natural Wellness Care (http://www.naturalwellnesscare.com/stress-statistics.html), which push a bunch of statistics to magnify a problem so they can sell or promote their “solution”. Dr Caroline Leaf is a communication pathologist and a self-titled cognitive neuroscientist. Cherry picking is one of her favourite tricks. Her teaching from the pulpit is littered with the phrase, “Research says …”, without ever mentioning where the research came from. You just have to take her word for it. Dr Leaf cherry picks extensively through her published work. There are too many examples to list them all, but her use of the quantum physics term, “quantum Zeno effect” is a prime example [1: p108, 2: ch13]. Another great example of cherry picking is Dr Leaf’s theory of the “Heart as a mini-brain” [2: ch11, 3: p40]. Dr Leaf exclusively relies on the information published by a group called HeartMath (http://www.heartmath.org), who themselves cherry pick extensively. HeartMath list reams of citations as evidence that the heart is a little brain, but even a basic understanding of routine clinical tests like an ECG shows that their ground breaking discoveries are little more than pseudoscience [see also Ref 2: ch11]. This is cherry picking in its purest form. Despite the study being over 20 years old, and so badly designed that even alternative scientific journals wouldn’t publish it, Dr Leaf claimed it as proof that emotions and intentions can alter DNA [Chapter 13 of my book, Ref 2 outlines why the study is so poor]. In her social media feed today, Dr Leaf quoted Peace Pilgrim, a silver haired mystic who walked across America for 28 years, owning nothing but the clothes on her back, all in the name of peace. 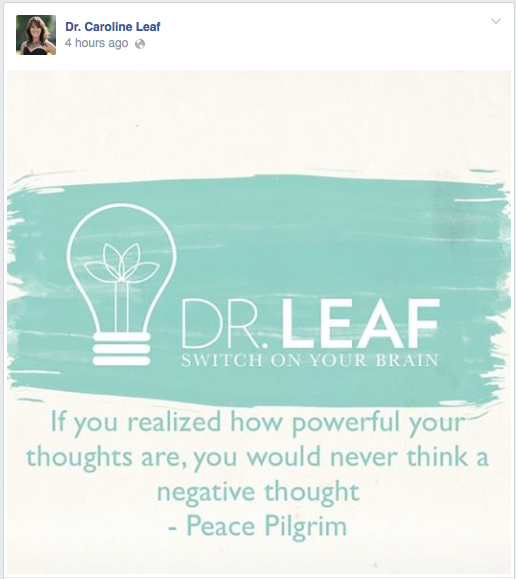 The quote Dr Leaf republished was, “If you realized how powerful your thoughts are, you would never think a negative thought.” This was taken from a radio talk that Peace Pilgrim gave in 1964 (http://www.peacepilgrim.com/steps1.htm). Peace Pilgrim’s quote is interesting, even inspirational, but not scientific. Inspiring quotes from half a century ago are fine, but only if you’re a motivational speaker or a B-grade life coach. Dr Leaf says she’s a cognitive neuroscientist. Real cognitive neuroscientists don’t cherry pick whichever quotes or studies fit with their prevailing theory. They look for the truth by synthesising all the evidence into an accurate theory. Dr Leaf may be trying to inspire people, but if she claims to be a scientist of any form, she has to adhere to a higher standard. She has to make sure that the words she uses are not just inspiring, but accurate as well, because facts and fruit are not the same. If you want a good Black Forest cake, then cherry pick all you want, but if you want the truth, consider all the facts first. This entry was posted in Biological, Caroline Leaf, Psychological and tagged Black, Black Forest cake, brain, cake, caroline, caroline leaf, cherry, cherry pick, cherry picking, cognitive neuroscientist, criticism, DNA, dr caroline leaf, Dr Leaf, ECG, effect, emotion, Facebook, Forest, heart, heart rate variability, heartmath, Hold, hold that thought, Leaf, meme, neurobiology, Peace, Peace Pilgrim, pick, Pilgrim, quantum, quantum zeno effect, rate, that, thought, toxic thought, variability, zeno by cedwardpitt. Bookmark the permalink.